What is Copper Sulphate Pentahydrate and what is it used for ? Copper(II) sulphate pentahydrate (CuSO4.5H2O), is a common salt of copper. 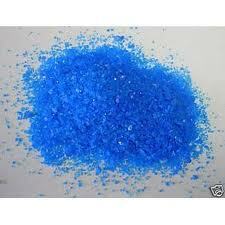 Copper sulphate is a bright blue, odourless crystalline solid which is soluble in water. The archaic name for copper(II) sulphate is “blue vitriol” or “bluestone”. It has numerous applications including as a fungicide, algaecide, pesticide, laboratory analytical reagent, feed supplement, zinc etching and as a mordant. Copper sulphate is soluble in methanol (10.4 g/L @18C) but insoluble in ethanol. At 650C copper sulphate decomposes into copper (II) oxide and sulphur trioxide. Copper sulphate kills moss on contact. It is commonly used for treatment of moss on roofs, paths etc but not for grass. For treatment of moss on grass it is best to use Ferrous sulphate. Mix 5–8g per litre of water. apply this solution at a rate of 1 litre per 5m2. When the moss is dead wash off under high pressure. Dissolve 30g of copper sulphate and 30g of citric acid in 1 litre of water. For each 5 litres of pond water add 1 drop of the made up solution (this equates to 0.15ppm). Do not allow levels of copper to exceed 0.20 ppm. Several chemical tests utilize copper sulfate as an indicator. In a flame test its copper ions emit a deep blue-green light. It is used infehlings solution and Benedicts solution to test for reducing sugars, which reduce the soluble blue copper(II) sulfate to insoluble red copper oxide. Copper(II) sulfate is also used in the Biuret reagent to test for proteins. Copper sulphate is also used to test blood for anemia. A drop of the patient’s blood is dropped into a beaker of copper sulfate solution: if it sinks within a certain time, then the patient has sufficient haemogloblin levels and is not anemic. If the blood floats or sinks too slowly, then the patient is iron-deficient and may be anemic. Copper sulphate is a commonly included chemical in children’s che­mistry sets and is often used in high school crystal growing and copper plating experiments. However due to its toxicity, it is not recommended for small children. Copper sulphate is often used to demonstrate an exothermic reaction, in which steel wool or magnesium ribbon is placed in an aqueous solution of CuSO4. It is used in school chemistry courses to demonstrate the principle of mineral hydration. The pentahydrate form, which is blue, is heated, turning the copper sulfate into the anhydrous form which is white, while the water that was present in the pentahydrate form evaporates. When water is then added to the anhydrous compound, it turns back into the pentahydrate form, regaining its blue colour. It can be used to plate metals with copper. Its use as an herbicide is not agricultural, but instead for control of invasive exotic aquatic plants and the roots of other invasive plants near various pipes that contain water. A very dilute solution of copper sulfate is used to treat aquarium fish of various parasitic infections, and is also used to remove snails from aquariums. However, as the copper ions are also highly toxic to the fish, care must be taken with the dosage. Most species of algae can be controlled with very low concentrations of copper sulfate. Other uses include: hair dyes, as a fining in winemaking, and the processing of leather and textiles. Risk phrases: R22– Harmful if swallowed. R36/38– Irritating to eyes and skin. R50/53– Very toxic to aquatic organisms, may cause long-term adverse effects in the aquatic environment. Safety phrases: S22– Do not breathe dust. S60– This material and its container must be disposed of as hazardous waste. S61– Avoid release to the environment. For full information see MSDS for copper sulphate pentahydrate above in documents section. Copper(II) sulfate (CuSO4), is a common salt of copper. Copper sulfate exists as a series of compounds that differ in their degree of hydration. 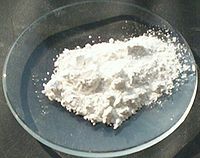 The anhydrous form is a pale green or gray-white powder, while the hydrated form is bright blue. The archaic name for copper(II) sulfate is “blue vitriol” or “bluestone”. The most common form of copper sulphate is in the pentahydrate form and there are over 100 manufacturers producing around 200,000 tonnes per annum. Approximately three-quarters of copper sulphate pentahydrate is used in agriculture, principally as a fungicide, but also for treating copper-deficient soils. Mix 5–8g per litre of water. apply this solution at a rate of 1 litre per 5m2. Dissolve 30g of copper sulfate and 30g of citric acid in 1 litre of water. For each 5 litres of pond water add 1 drop of the made up solution (this equates to 0.15ppm). Do not allow levels of copper to exceed 0.20 ppm. Several chemical tests utilize copper sulfate as an indicator. In a flame test its copper ions emit a deep blue-green light. It is used in fehlings solution and Benedicts solution to test for reducing sugars, which reduce the soluble blue copper(II) sulfate to insoluble red copper oxide. Copper(II) sulfate is also used in the Biuret reagent to test for proteins. Copper sulfate is also used to test blood for anemia. A drop of the patient’s blood is dropped into a beaker of copper sulfate solution: if it sinks within a certain time, then the patient has sufficient haemogloblin levels and is not anemic. If the blood floats or sinks too slowly, then the patient is iron-deficient and may be anemic. Copper sulfate is a commonly included chemical in children’s che­mistry sets and is often used in high school crystal growing and copper plating experiments. However due to its toxicity, it is not recommended for small children. Copper sulfate is often used to demonstrate an exothermic reaction, in which steel wool or magnesium ribbon is placed in an aqueous solution of CuSO4. Its use as a herbicide is not agricultural, but instead for control of invasive exotic aquatic plants and the roots of other invasive plants near various pipes that contain water. Addition of copper to copper deficient soil. Preparation of Bordeaux and Burgundy mixtures. Mixed with ammonium carbonate to produce “Chestnut compound”. Preservative for pulp, wood and wooden structures. As a disinfectant, antiseptic, germicide and bacteriostat. Inhibits the growth of bacteria like Escherichia coli. Treatment of parasitic infections in aquarium fish. Removal of snails in aquariums. For the control and prevention of foot rot in cattle and sheep. As a growth stimulant for pigs and chickens. For the control and treatment of scum on lakes and ponds. As a preservative in glues. Mordant in vegetable dying industry. 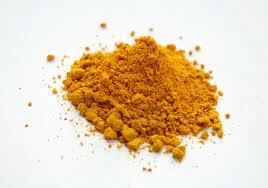 As a dye for hair. Green colouration in fireworks and in flame tests. Preparation of diazo and aniline black dyes. Preparation of other copper compounds. As an electrolyte in plating and refining industries. As a flotation agent in mining. In the purification of butadiene. In the purification of petroleum oil. Etching agent in engraving especially zinc in the intaglio printmaking. In glass and ceramics industry to colour. For blueing steel and the colouring of zinc and aluminium. For the control of concrete setting. Control and protection against lichen, fungus and moulds. In the preparation of Fehlings solution, Biuret Reagent and Benedicts solution. In the laboratory to demonstrate exothermic reactions where steel wool or magnesium and placed in an aqueous solution of copper sulphate.